The past few days have been tumultuous with the new US President signing an Executive Order late on Friday proposing a 90-day suspension of visas and other immigration benefits to all nationals of Iran, Iraq, Syria, Sudan, Yemen, Libya and Somalia. This happened as I was working on completing a paper on blood supply chains with a former doctoral student of mine from Iran, who is now a Professor - Dr. Amir H. Masoumi, and another former doctoral student of mine from China, also now a Professor - Dr. Min Yu. This Executive Order (EO) struck very close to home, especially since last year another doctoral student of mine at the Isenberg School of Management, Sara Saberi, had returned to Iran, for the first time in about five years, and would not have been able, most likely, to return to the US to defend her thesis and to begin her Assistant Professorship at WPI, had the EO happened last year! A petition against the EO had been started, which was featured in The Washington Post, so I signed it, and, at this point, the petition has over 40 Nobel prize winners signing it, over 7000 faculty, and over 12,000 other academic supporters. Researchers live by the free exchange of ideas and disciplines, especially scientific ones, cannot move forward without the free exchange. So, I started to wonder, how many different countries of origin were represented by my collaborators with whom I had published papers or written or co-edited books? United States: Trisha Wolley Anderson, J. Aronson, Phillip M. Bishop, David E. Boyce, Ken Calvert, Paul Dupuis, Jim Griffioen, Kitty Hancock, Merritt Hughes, Patricia L. Mokhtarian, Craig L. Moore, Ladimer S. Nagurney, Charles F. Nicholson, Frank Southworth, John K. Stranlund, Kai Wu. Five different continents are represented above. If I have missed someone, just let me know, and I will add or correct whatever needs correcting. It is inspiring to see the diversity in countries of origin of the above collaborators and also to reflect on our joint work together. Some collaborators are operations researchers / management scientists / mathematicians; others are engineers, computer scientists, or economists. Some have moved and are in different countries than their birthplaces and others have remained. Working with collaborators is always enjoyable and synergistic plus motivating as well. I was born in Canada and proud of it. One of my favorite committees to serve on for our professional society of INFORMS (Institute for Operations Research and the Management Sciences) is the History and Traditions Committee chaired by Dr. Marc Eisner of Cornell University. Today we heard from Dr. Irv Lustig (whose TA I was back in our Brown University days before he left to get his PhD at Stanford), and who has served on this committee for many years, that the video interviews that were conducted at our conference in Nashville, Tennessee this past November, have now been edited and posted online, along with the transcripts. The newly published interviews are a must see (and you may wish to also read the transcripts). I am listening to one as I type this blogpost (after having already read the transcript). Irv will be posting something soon to INFORMS Connect to advertise the availability of these videos. In his message to the committee, Irv also acknowledged many INFORMS staff members who made this possible: Mary Magrogan, Cheryl Clark, Jessica Bennett, Tracy Cahall, and Marisa Van Der Eijk for helping with the coordination of the logistics in Nashville, including securing and setting up a location for the interviews. Mary Leszczynski uploaded the videos to YouTube. Also, Jeff Cohen, according to Irv, found the videographer in Nashville who clearly did a great job filming the videos and editing them. I recommend starting from the top of the list above and working your way down. You will be inspired, educated, and energized. Professor Balas is 94 years old and his life story covers almost a century. Professor Balas is still supervising doctoral students. Professor Larson we have hosted at the Isenberg School at UMass Amherst in our UMass Amherst INFORMS Speaker Series and his advice for doing high quality research is right on target. Professor Ed Kaplan, who is his interviewer, was our most recent President of INFORMS, and we also hosted him at the Isenberg School. It so happens that Dr. Irv Lustig spoke in our series the same semester that Professor Kaplan did. Both the interviewees and the interviewers deserve applause for these very valuable, informative videos and transcripts. Also, the full list of oral history interviews of operations research luminaries can be found on the INFORMS website on this link. Yes, I am sure that my fellow WORMS (Women in Operations Research and the Management Sciences) members have noted that there are no interviews with women posted (yet). I am working on this but age is coming before gender, at least, for now. It has certainly been an exciting start to the new 2017 year! 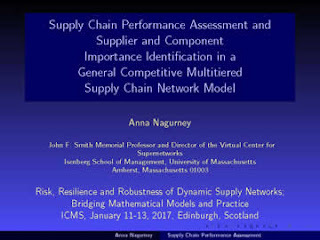 My collaborators and I were delighted to start off the new year with two journal publications, including that of the paper, Supply Chain Performance Assessment and Supplier and Component Importance Identification in a General Competitive Multitiered Supply Chain Network Model, Dong Li and Anna Nagurney, Journal of Global Optimization 67(1): (2017), pp 223-250. It is always exciting to get a reprint, as well. Our paper appears in a special issue of the Journal of Global Optimization edited by Professor Panos M. Pardalos. 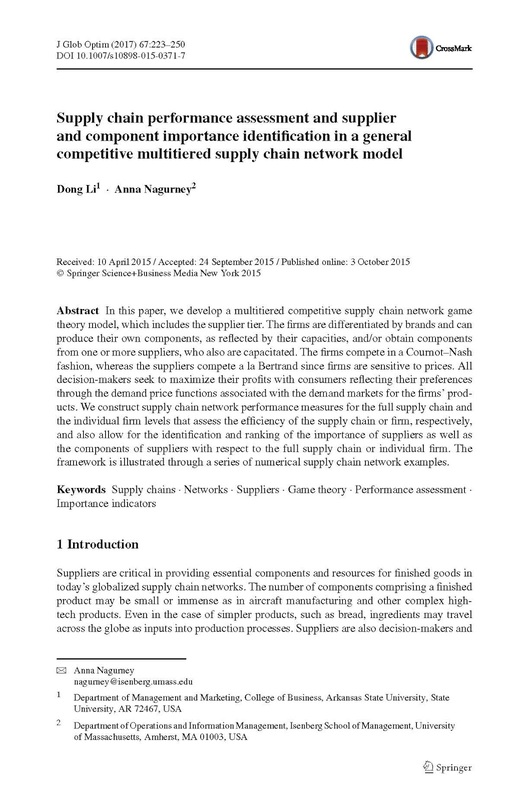 What makes this paper unique is that, not only do we construct a multitiered supply chain network equilibrium model with suppliers, but we also provide measures for assessing an individual firm's performance in a supply chain network and also that of the entire supply chain consisting of competing firms and suppliers. In addition, we define importance indicators of suppliers as well as components in the production processes to individual firms as well as to the entire supply chain network. For those of you who are interested (there are some very informative images therein), the link to a presentation that I prepared on this paper, with additional motivation and results, can be found here. This paper is already getting cited, which is always gratifying to researchers. Do you remember the first professional conference presentation that you ever gave on your research? I suspect that no matter how many years ago or how recent it was that you remember it very well. In fact, I even recall the outfit that I wore but, then again, I was the only female presenter at the conference and, not surprisingly, the only one wearing a skirt suit, which was bright blue. There were numerous MIT professors in the audience and several admirals as well. I decided to write on "your first conference presentation" not only because one of my doctoral students is giving hers this week at the INFORMS Computing Society (ICS) Conference, which is taking place, January 15-17, 2017 in Austin, Texas, but also because of an amazing coincidence between her first talk and my first talk. It is coincidences such as these or may I say, "serendipity," that makes being an operations researcher so much fun, interesting, and filled with surprises. And some of the surprises and special delights involve the great people in our profession. This morning, my doctoral student, Deniz Besik, who last week endured a 12 hour wait at the Istanbul airport for her flight back to Boston because of snow there, and finally made it back from a winter break, emailed me the photo below of herself with a "celebrity" that she met at the ICS Conference. The operations research superstar, and member of the National Academy of Engineering, is Professor Dimitri Bertsekas of MIT, who is one of my favorite professors on the planet! He is one of two plenary speakers at the conference. I smile every time I look at this photo because guess who was on the program of the first conference that I ever spoke at - indeed, Professor Bertsekas! That conference was the second MIT/ONR Workshop on Distributed Communication and Decision Problems Motivated by Naval C^3 Systems. It took place at the Naval Postgraduate School in beautiful Monterey, California. I was working at Systems Consultants then in Newport, Rhode Island, and had not even completed my Master's degree from Brown University. In fact, this was also my first publication since the conference resulted in a 4 volume refereed proceedings. You can see my name and paper title below on the same page as Bertsekas'! My talk was on: "The Role of Optimal Routing in Multiplatform Naval Task Force Operations." Networks were always a favorite research theme of mine! Only volume 2 is online and there you can see the list of all presenters, many quite renowned. What is also quite amazing is that I ended up continuing at Brown University for my PhD in Applied Mathematics, with a specialty in Operations Research, and my advisor was Professor Stella Dafermos, who was a good friend of Bertsekas'. Yes, they are both Greek. She passed away at age 49 but left a tremendous intellectual legacy. Deniz' talk at ICS is on: "Quality in Competitive Fresh Produce Supply Chains with Applications to Farmers' Markets" and her full presentation can be downloaded here. I even blogged about some great advice that Professor Bertsekas gave me a while back, which I still follow. Hope that everyone has an amazing time in Austin, Texas! In mid December I set out to write an article for The Conversation, which is one of my favorite sites. I was lucky to work with a fabulous Editor, Lynne Anderson. The article, Uncertainty in blood supply chains creating challenges for industry, is a distillation of some of the research that we have done on blood supply chains at the Virtual Center for Supernetworks at the Isenberg School, coupled with updates on the latest economic issues facing the industry. 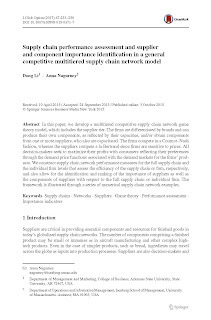 I argue in the article, for example, that supply chain analytics can help in quantifying any synergies associated with mergers and acquisitions in this industry and help in better matching supply with demand. 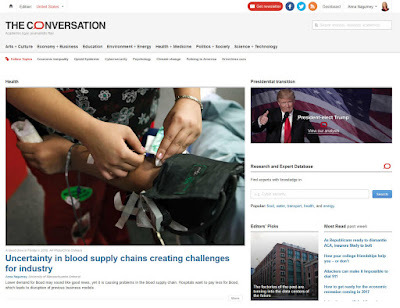 My article was the top story on Monday in The Conversation and was featured on its homepage. 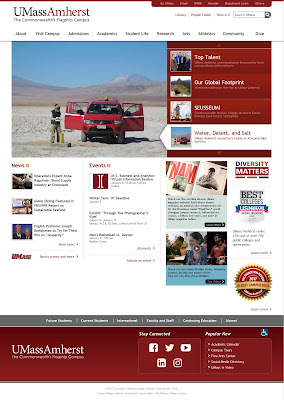 It has been picked up by several news outlets, including the San Francisco Chronicle. The article is characterized under Health and Medicine. I never, ever thought that something I wrote would end up on The Conversation's homepage next to and on the same page as a photo of President-elect Trump but it did so on Monday. 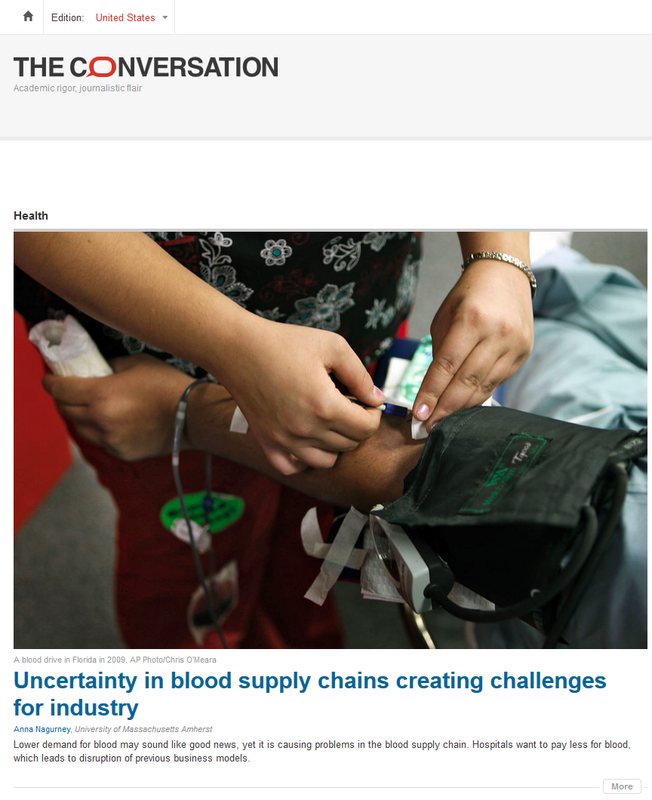 This article has attracted good, high quality attention and I have had the pleasure of getting messages from professionals from various countries highlighting even how blood supply chains are managed there and what kinds of incentives are given to attract donors. Given that during the holiday season and the winter there may be fewer donations, this is quite relevant, although the industry, overall, now has a much lower demand for blood in the US than only a decade ago and one of the reasons is that fewer pints are transfused in many surgeries and new surgical techniques result in less loss of blood in patients. I very much enjoyed working with the Editor and in getting the article polished and published and plan on writing other articles for The Conversation in the future. It was also cool to see the article make the UMass Amherst homepage (and, appropriately, right next to an announcement of an event for a new Master's in Business and Analytics at the Isenberg School! As operations and analytics supply chain researchers it is important to get the news on the research out to the public. This is one reason that I also blog! Many thanks to Lynne Anderson of The Conversation for helping us to get the news on our research out!